You will be given a reference e-book to read which has 391 pages And the test will be based on that e-book , you can take final test within 1 year of purchase. Wealth management refers to a kind of discipline which involves investment portfolio management, financial planning and a wide array of comprehensive financial services. It can be defined as an investment advisory discipline which allows families, individuals and small business owners to coordinate together estate planning, tax professionals, legal resources, investment management and retail banking with the help of a certified wealth manager. Wealth management is also popular for being a high-level structure of private banking designed especially for the affluent. An individual is required to accumulate a considerable amount of wealth in order for the strategies for the wealth management process to become effective. Wealth management can also be defined as a popular self-branding reference used by financial representatives and advisors in describing a wide array of potential business models and functions. Certified wealth management experts are responsible in constructing an investment portfolio for their clients and advise them on the things that they can do to properly and effectively prepare current and future financial needs. The investment part of the wealth management process usually covers the allocation of assets to the entire investment portfolio and selecting individual investments. Wealth management is also a planning function which aims to incorporate tax planning and estate planning in the investment portfolio. Fully understanding wealth management as a process and as a discipline is greatly possible if you take up a wealth management certification course from Brainmeasures. 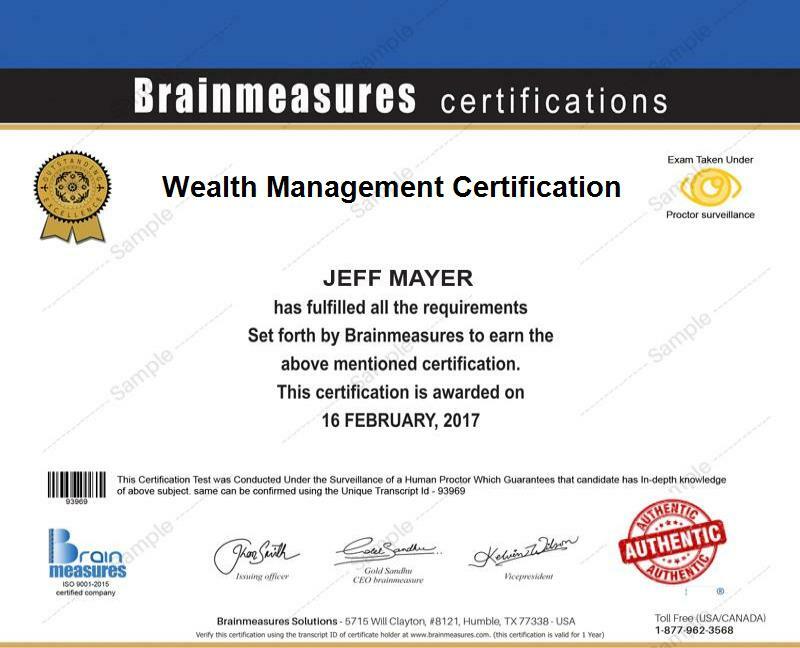 As an online certification company, you can expect Brainmeasures to furnish you with your certificate in the field after you complete its wealth management course. An advantage of enrolling in the wealth management certification course from Brainmeasures is that the company is already certified by ISO and this makes it even more effective when it comes to providing high level of knowledge to its practitioners. With the help of the certification course, you get the chance to receive the most updated wealth management training which covers all aspects that are relevant to the field. You also have a guarantee that all the information included in the program is accurate. Completing the wealth management certification course is very rewarding since this will allow you to finally grab a copy of your hard copy wealth management certificate. Hundreds of individuals and professionals are going to be benefited by taking up a wealth management certification course. This certification course is more ideal for project managers, middle managers and professionals in the traditional finance fields including research, investment banking, sales and trading, structuring, relationship management, risk originations and management, audit, accounting, information technology and legal and compliance. Newly hired professional associates and analysts in the finance industry can also be greatly benefited by the wealth management certification course which is now accessible at Brainmeasures. Working as a wealth management expert can be very profitable. Holding your wealth management certification allows you to earn an annual salary of around $60,000 for beginners and up to $218,000 for the more experienced ones who are now holding higher positions in an organization.